We’re big fans of liquid soap in my household. It’s altogether more convenient, tidier, and often more aesthetically pleasing. It also comes in a progressively more varied range of sweetly smelling brands, some so eye-poppingly expensive that they make hand soap the latest in luxury living. While I don’t usually go for the old fashioned bar of soap therefore, I must admit to having become smitten with the authentic square soaps characteristic of the Marseille region when I was in Provence during the summer. From deciding against buying such soaps quite vociferously at the beginning of the trip, my will was slowly worn down as we went from place to place, and boutique to boutique, charmed by the wafting homely perfumed smell of these traditional Provençal soaps in all their varying shapes and colours. So when in Saint-Remy-de-Provence we came across a sophisticated little boutique (ironically, run by an Englishman) selling Marseille soaps which were not only traditional, but also charmingly misshapen so as to give them a classic, handmade look, I was sold, and, repenting for my former reticence to buy, spent a good wad of Euros on a variety of those soaps of all different shapes and sizes. Although we are using one such of the smaller soaps (and keeping the mess at bay in a purpose-made little concrete soap dish bought from the same place), the main reason for buying the soaps was for their decorational value. For in a bathroom like ours which is characterised by its square window, square sink and square taps, the soaps were an obvious attraction. So for this week’s Daily Norm photo of the week, I thought I would share with you a rather chic photo of my Saint-Remy soaps, piled up elegantly on the square windowsill of my square bathroom window. Despite being so traditional in the method of their creation, these soaps look startlingly contemporary in this modern bathroom setting, their varying shades of creamy ochre contrasting effectively against the deep grey of my bathroom tiles. A perfect example of when traditional Mediterranean charm meets contemporary urban minimalism, but somehow the two fuse so inexorably well together. Just fantastic! 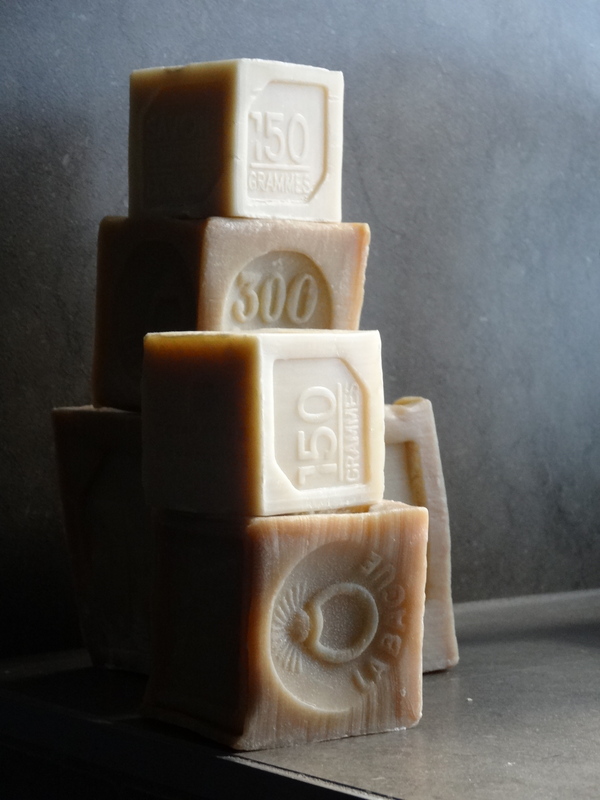 …the look of the blocks of soap and the way you describe how they can be part of your ambiance. Yum! I can almost smell them!